Looking to enhance your property’s curb appeal with fencing? 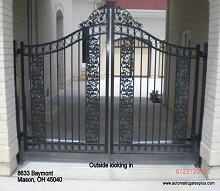 A decorative iron fence can add beauty to any outdoor space. Installing a wrought or iron fence to your patio, balcony or yard will instantly increase the value of your property and make the area more visually appealing. Fencing is also a great way to incorporate privacy and security from neighbors and pedestrians.